Rumors that land reserved for a new primary school to be built in Philippi to cater for children from Samora Machel had been sold to a soccer club, has sparked a class boycott at a Mitchell’s Plain school Samora Machel children have been allocated to. 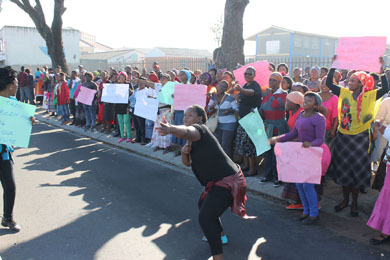 The three-week long boycott which has resulted in no classes having being taught at Mitchell’s Plain’s Khanya Primary, spilled over into a protest by about 220 parents on Tuesday. After apparently being promised by the Western Cape Education Department that a primary school for the Samora Machel children would be built at Philippi stadium, the parents were incensed when soccer club Chippa United played a match there three weeks ago. After hearing that Chippa United owner Chippa Mpengesi had purchased the land, hundreds of parents forbade their children from attending classes at Khanya Primary. On Tuesday parents invaded the school and attempted to force teachers out of the staff room. Angry parents said they want their land or the WCED must identify alternative land on which to build a school for their children. Parent Thembeka Nguqu said in 2006 the WCED promised to find land on which to build a school to service Samora Machel children. “In 2011 they came back to us saying they found us land in Phillipi stadium. While we were waiting for the school to be built we hear that the Phillipi stadium has been sold to Chippa United without us being informed,” said Nguqu. Parent Bolekwa Gcwabe said initially they did not have a problem with their children having to go to Khanya Primary in Mitchell’s Plain but then their children started getting robbed inside the school premises. “We can’t risk our children’s lives anymore, this school is not safe at all,” said Nguqu. WCED spokesperson Paddy Attwell said, the Phillip stadium was identified as a possible land but the WCED never owned the land and nothing was ever finalised. “The department is already planning a new school in Philippi and is in the process of identifying suitable land,” said Attwell. He said The WCED currently buses about 1 200 learners from Philippi to Khanya Primary, which was previously vacant and there was a lot of pressure on existing schools in Philippi.